Giveaway: Hallmark Keepsake Ornament, Recordable Storybook and Text Bands! Once again Hallmark is debuting some fantastic new Keepsake ornaments at San Diego Comic-Con from July 11th-15th in San Diego, California. This year they’ll have three very limited edition ornaments for sale at the convention. If you’re lucky enough to attend, then you’ll have a chance at 4-LOM and Zuckuss ( Star Wars ), A Human Hero ( The Dark Knight Rises ) and Cylon Centurion ( Battlestar Galactica ). The runs of each are limited 1000, 875 and 750 with prices from $25 to $35 so if you want these you better head to their booth in the Lucasfilm Pavilion first thing. While you’re there, you’ll also get a sneak peek at some of the ornaments planned for 2013, get free autographs from one of the artists behind 4-LOM and Zuckuss and meet Bob Holt, the creator of hoops&yoyo. Can’t make it to San Diego Comic-Con? All is not lost. Hallmark is offering a special Comic-Con Gift Pack to one lucky GeekMom reader who will get a pair of the new Hallmark Text Bands and their choice of one Keepsake Ornament and one Recordable Storybook from a select list. You will be able to pick from The Amazing Spider-Man, The Dark Knight Rises, Iron Man, Thor, Merida (Brave) or a TIE Interceptor for your Keepsake Ornament. 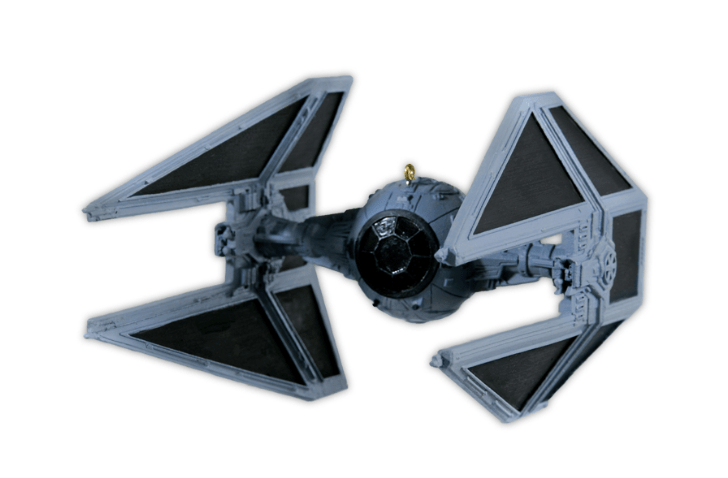 I just got the TIE Interceptor today and have been zooming it around the kitchen so I highly recommend that one. Then for your Recordable Storybook you can pick either The Wish My Heart Makes For You or You’re a Hero! All The Ways You Save The Day . You can enter for a chance to win simply by leaving a comment about your all-time favorite Hallmark ornament and we’ll select a random winner once the contest closes. Deadline for entry is midnight EST on Friday, July 13th. Open to shipping addresses within the Continental US only. I received this giftpack for review purposes.